This entry was posted in Recent Posts and tagged Audrey Dawn, Blue, Good Morning, Life, Musings, Nature, Oldest Daughter & Redheaded Sister, Photography, Poetry. Bookmark the permalink. You may have this photo, in fact, I insist. Take it, please…. Thank you, my Photographer Philosopher Extraordinaire. 😉 You remembered! Aww! The Audacious feathered clouds ~ a perfect title for the photo! Those clouds are tops. Just little wisps. They look sweet enough. You and your “tops”….who’d you pick that up from…someone in LA? 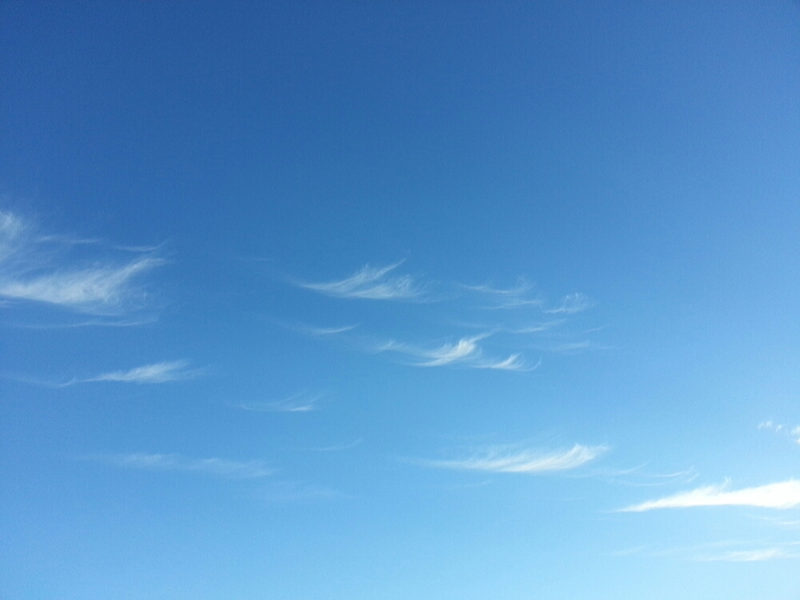 *laughs* The clouds do look like wisps, one of my favorite words, maybe my favorite! Umm…what are you thinking about? These clouds couldn’t possibly have you thinking of wickedness. *laughs* I’m not sure! I said it before then. I think it’s one of my fav words. Tops. Just like yours is wisp! Have you ever read Ender’s Game? Nah, not wickedness. Just thinking of the trip to LA, actually. Oh, just not to me then, I guess. Tis a cool expression. Tops. Wisp. Cool… No, I haven’t read it. Tis a boy book, I think. Should I? Will you tell me about your trip? What has you thinking? Well, I suppose I use it widely. I think Mr. Warrior would like it. Oh, I don’t know. Tis up to you. You probably wouldn’t like it. Just left me with lots to think on. Why does everything have to be complicated? I’ll try the expression on him and let you know if he picks it up. *smiles* Why did you ask me that, Duke? I want to know. *laughs* Okay, then! Well, ’cause I just read it, and I was curious if you had. That’s all. Complication. You should write a poem about it. Oh. Pass the sugar, please. Really? What do you want the sugar for? Yes, really. Grapefruit. Tis so sour… What is the book about, Duke? Did you like it? They are sour! It’s about training a commander to save mankind. Do you like them? I sorta do…but only if there’s sugar. Oh, yeah, tis a man’s book, for sure. Do you want to save mankind? I used to have them…I think I do! Nah, too hard! I think I’d die from trying. Ever the couch potato. ..
I’d like to be one…for a day, I think. This looks like my view over the Gulf. Has been there a couple of days. Nice poem. So nice to see the sun. I agree. It was a long time comin’. Those clouds are like angel wings! I wish I could send them to you, my friend. I would bring them personally!! 🙂 I’m dying to drop everything and visit the UK. Oh, for a beautiful day like that! Audrey, I NEED some sunshine — I tolerate the cold, but the dreariness is most off-putting. Guess I shouldn’t complain, though. I’m not shoveling like those poor folks out East, nor am I fretting over the power going out and freezing half to death! Debbie, you would love it here today. The sky hasn’t a cloud in it… I feel for the northerners right now. Ugh!! I like the poem, reminds me of Blue October’s “Into The Ocean”. I noticed the pattern as well, 3 words per line, each line a little longer than the last. Nice form! What a great song, Ry. Your thought made me smile. Yes, well, sometimes I think before I write and sometimes I write before thinking. Glad you enjoyed this form. I sorta like the gradual line change. It looks pretty. I can be quite a girl, you see. 🙂 Thanks for reading.